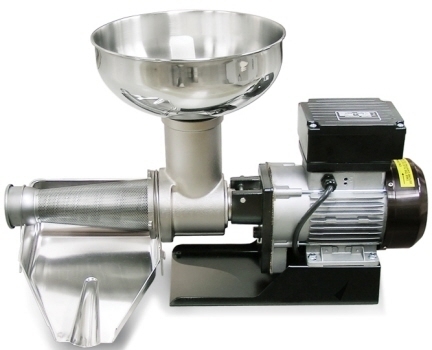 SP5 - 3" Diameter Neck Tomato Milling Attachment 1/2 Horse Power - 380 Watts 18/10 Stainless Steel Screen Double Threaded Screw Feeder Heavy Cast Iron Neck Treated with Special Resins - your choice on diameter Extra Large Stainless Feed Bowl Permanently Lubricated Spheroidal Cast Iron Main Gear Output Revolutions: 120 per minute Motor: Asynchronous with Condenser It is ideal for squeezing both unprocessed or boiled tomatoes and other fruit and vegetables suitable for producing juices, purees and conserves. Put the fruit or vegetables (without stones or stalks)into the funnel and press it into the body of the machine using the pestle provided. The screw feeder, rotating about its axis will push it forward and press it against the screen. The juice will come out of the holes in the screen and fall into the trough which conveys it to the collection receptacle while the seeds and peels are eliminated through the small funnel on the end of the screen. It is possible to put the seeds and the skins back into the machine in order to obtain an improved squeezing. o not run the machine empty. After usage wash all parts of the machine (consisting of 6 easy to disassemble parts) with water and mild detergent and dry thoroughly. The only maintenance besides cleaning after usage is keeping the drive unit lubricated (indicated in the instructions). Click the button below to add the Fabio Leornardi Mr0 1/2 Hp Tomato Milling Machine Fabio Leonardi #5 to your wish list.